In today's day and age, keeping up with new technology and speaker products can prove exhausting. From portable Bluetooth speakers, to studio monitors, PAs, and home theater systems, there are many categories of the term "speaker." Each category also has multiple brands and multiple choices within the brand. And although the try-before-you-buy method is preferred, we know that not many people actually get to test the product before they buy it. Internet reviews such as this one can serve as a good tool for techies looking to buy, or even just learn. In this review, we're taking a look at the LG LAS551H speaker. The 2015 LG Electronics LAS551H Sound Bar and Subwoofer is a pretty awesome sound package overall. Our reasons? First, it’s a favorite among buyers on Amazon; it’s so popular that it sold out! Second, it has enough features to keep anyone entertained, and its advanced audio technology provides a fantastic, luxurious listening experience. The sound bar and subwoofer package is fully equipped with Bluetooth. Sound Sync Wireless is a major feature that gives this set of speakers a premium technological appeal. There is no need for dangerous wires dangling around everywhere in the room. Once we pulled it out of the box, the speaker was easy to set up. The instructions perfectly described how to mount the soundbar. We never needed the help of an expert (though, if you’re not comfortable drilling holes to mount the bracket, expert help is easy to find). The subwoofer is wireless, so we found the perfect spot for it in the room, and the acoustics are great. The LG LAS551H comes ready with Bluetooth connectivity, and it’s what powers the Sound Sync technology. We tested out the wireless features on our favorite movie and the effects blew us away. Conversations were crystal clear, and the explosions were out of this world. Connecting it to the new LG TV was a simple matter of utilizing the Sound Sync feature to sync the TV to the soundbar and subwoofer. Everything connects wirelessly. This is really convenient and easy to use. Overall, the audio playback is really good, and the remote control equalizer makes it simple to set the sound exactly the way you like it. 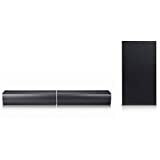 LG released this highly popular sound bar in 2015 in limited quantities. At the time of writing, Amazon was sold out; however, you can manage to snag one for a really great price elsewhere. There are a few places where adamant music lovers can find this soundbar and subwoofer combination on the internet. The price tends to hover around the $300 range unless it is on sale or used. The warranty included with every LG product covers parts for a period of one year, so you can rest easy knowing your speakers are covered. This is perfect for such an important investment. Of course, we had to look around to make sure we were getting the best speakers we could find. Our Michael Jackson records and Mission Impossible movies needed to be heard in purity! So, here is the list of sound bars we researched that can contend with the LG. There are a few other sound bars that had to be looked at throughout the research process. Using Bluetooth audio, we can connect up to three phones and play all our favorite music. With the touch of a button, it’s easy to go from TV-time to party-time. Everyone in the family can enjoy the new home speakers. With a single touch of a button, Bluetooth activates and Karaoke night can begin. Ease of use gets 5 out of 5 stars. Since we have an LG TV, the Sound Sync really comes in handy. Sound Sync lets us connect both the sound bar and subwoofer wirelessly, spread them out, and fill the whole room with sound. For sound connoisseurs, this is an absolute must-have. You can have the theater experience right in your home. The best part is you can have everything set up in minutes after removing it from the box! 5 out of 5 stars on assembly time. For the price, this soundbar and subwoofer easily slide past the average TV in acoustic design quality. It enhanced every bit of dialog and made our watching experience feel just like the theater. There were no drop-offs in sound when we connected wirelessly, and there was no lag in streaming quality. It gets 4.5 out of 5 stars. LG provides a 1-year warranty on this excellent soundbar. They also cover all the parts for 60 days. 4 out of 5 stars. This soundbar and subwoofer are super easy to use. The 5-button configuration makes it a breeze to use right out of the box. Novices and pros alike will appreciate the simple controls and Bluetooth connectivity. It’s easily a 5 out of 5 for ease of use. The wall mount and wireless subwoofer are easy to put up for the at-home handyperson. The soundbar only weighs 5 pounds, so you can position it by yourself and have it up in a matter of minutes. The wireless subwoofer can be positioned anywhere in the room. For assembly, we gave this soundbar and subwoofer 5 out of 5 stars. Build quality on this soundbar is pretty shoddy. The left speaker is infamous for going out and sometimes making a crackling noise right out of the box. Because of this flaw, we gave this soundbar and subwoofer package a 2 out of 5 for build quality. VIZIO offers a pretty good warranty on their products. It covers parts and labor for 1 year. The crackling issue was easily resolved thanks to this necessary warranty. We’re giving this sound bar’s warranty 3 out of 5 stars. A soundbar, and subwoofer combo is a great find at this price. Shoddy design could go wrong. This particular model comes equipped with Bluetooth streaming and Google Cast. It can be programmed to respond to your TV remote, so there is no need to keep track of all those errant remote controls. Google Cast and Bluetooth may be a little advanced for some users, but the instruction manual lays everything out in a way that’s super simple. Ease of use gets 4 out of 5 stars. LG packages the mounting equipment for this lightweight soundbar, and the subwoofer is wireless. There are a ton of connection options for this combination, so users will find many creative ways to get their theatrical experience. Assembly gets 5 out of 5 stars. Advanced options and new technology are not without their flaws. There have been reported issues with the firmware updates needed to maintain the functionality of this soundbar. This could frustrate some newer users. Those seeking a sound system without all the bells and whistles might enjoy one of the earlier models. Build quality is 3 out of 5 stars. 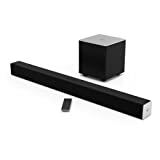 Purchasing this soundbar and subwoofer through Amazon grants, you access to 60 days of advanced technical support. Join that with the year-long warranty on parts from LG, and you’re in good shape. 4 out of 5 stars. Advanced connection options and functionality at a mid-range price make this a great option for average users. The most expensive sound bar on the review list, this model has the most features. It comes equipped with Bluetooth connectivity, LG Sound sync, and Adaptive Sound Control. The soundbar splits into a pair of twin speakers so that you can get more coverage from your acoustics. Everything can connect wirelessly with the touch of a button, so we rated this model 5 out 5 for ease of use. You can mount this sound bar on your drywall with the supplied kit or spread the speakers around your room. It’s really versatile! Plus, it’s all wireless so that you can avoid any loose wires hanging around. The options make assembly on this soundbar and subwoofer a 5 out of 5. The options for setup and connectivity on this model make it popular, but there have been some reports of the Wifi connectivity feature interfering with users’ home wifi signal. Also, the signal seems to drop from time to time. Build quality could be improved on the wireless front, so we’re rating this a 3.5 out of 5 stars. The included warranty covers manufacturer’s parts for the length of 1 year. LG products have a great reputation for lasting a long time, so we give this model 5 out of 5 stars for warranty. If you’re a picky listener like us, then you’ll love the ability to control the equalizer straight from the remote control. Depending on what form of media you’re playing, you can optimize your sound for the best experience possible. The price places this one out of range for many first-time buyers. After reviewing the pros and cons of the other models on the market, many of them have problems with maintaining connectivity. We didn’t see this issue with the LG LAS551H. It’s highly important to maintain this basic functionality for the optimum experience. The setup is similar for all the lightweight models, which is a really nice feature since it’s so convenient. It’s great that the LG LAS551H's pros outweigh the cons on this model in such a heavy way. The wireless technology comes in handy when many members of the family want to engage in the fun, and the EQ is perfect for setting any sound. What it lacks in pizazz and added features, the 2015 LG Electronics LAS551H Sound Bar and Subwoofer makes up for in pure sonic proficiency. At this price, the power, functionality, and sound quality can’t be beaten. We found some pricier models with more features that, upon reading their reviews, we realized couldn’t compete with the musical appeal of the LG. Combine that with complete wireless and Bluetooth functionality, and the choice was easy. Overall, we wouldn’t go with any other sound bar and subwoofer than this one. The LG LAS551H is easily worth the 4.5 out of 5 stars. If you’re searching for a gift for someone or just something nice for yourself, this is the perfect speaker set. The performance is top tier, and the price is fair. Overall, we wouldn’t go with any other sound bar and subwoofer than this one. If you’re searching for a gift for someone or just something nice for yourself, this is the perfect speaker set. The performance is top tier, and the price is fair.